Who is Billy Murray Anyway? Music chart enthusiasts have long conducted excruciating exercises to rank songs and artists via the popular song charts. Music VF is a wonderful and extremely deep site dedicated to identifying all charting songs for all-time both in the U.S. and in the U.K. In their own words “Music VF is “is a database of 100 000+ US and UK music hits since 1900. You can browse our charts by artist, by year, or by decade … or you can use our search engine on artists names or songs titles.” The Music VF home page displays a compilation of the “Top 1000” artists of all time. This is always a subject open to debate due to the very diverse set of circumstances present through-out the years pertaining to the criteria for ranking songs: sales, airplay, regional reports, jukeboxes for a long time – and so on. The above list should raise more questions that it answers – for instance – where are the Beatles? (number 11 is the answer). Most of these top ten’rs hailed from a time when the charts were small – compositions lingered for a long time – and sales figures were of course lower. But just how did Madonna crack the top 10? Questions for another time. He was born in 1877 and passed away in 1957. I don’t recall ever listening to Billy or even hearing about him. 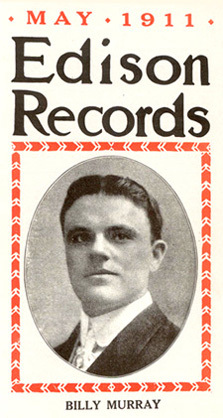 His first charting songs – beginning in 1903 – were released on “music cylinders”. His first vinyl release occurred in 1906 teaming up with Ada Jones – another artist whom I am not familiar with. She landed on the charts more than 40 times from 1905 until 1917. Whew…. – Move over Fab Four!